The average cost of memory care in Mayo is $2,500 per month. This is lower than the national median of $4,650. Caring.com has helped thousands of families find high-quality senior care. To speak with one of our Family Advisors about memory care options and costs in Mayo, call (855) 863-8283. Located in Lafayette County at the top of the Florida panhandle, Mayo is a small town with a population of 1,237, including 213 seniors aged 65 and older. In the county, it's estimated that some 160 people in that demographic are living with Alzheimer's disease or another form of dementia. Eventually, many of these people may need full-time care from an assisted living facility that is qualified to admit patients with memory impairments. In Florida, these residential treatment centers must receive an Extended Congregate Care (ECC) license from the Agency for Health Care Administration. This organization is responsible for regulating healthcare facilities and providers. Mayo currently has one ECC facility, and five others are located in nearby Gainesville. The violent crime rate in Mayo is substantially higher than the U.S. average, as is the rate of property crimes. However, ECCs provide an extra layer of security with self-locking doors, surveillance cameras and 24-hour guards. For peace of mind, you may wish to verify what safety measures are in place at each ECC you're considering. Mayo's weather is pleasantly predictable for northern Florida. While snow doesn't fall here, the town receives 53 inches of rain and 235 days of sunshine. Additionally, high temperatures peak around 92, and lows average around 40. If your loved one is bothered by heat and humidity, you may want to check the facility's resident safety plan or consider another geographic area. The local cost of living is less than the national average at 81.1 versus 100. Housing is far cheaper in Mayo than most of Florida, but healthcare is about even with state and national norms. For most seniors, healthcare costs won't be unexpectedly high or low, which may benefit fixed-income retirees. Many seniors gravitate to Florida due to its lack of a personal income tax. Additionally, the maximum sales tax is competitive at 7.5 percent. These policies may allow families to set aside more funds for medical care or personal assistance. Memory Care costs in Mayo start around $2,500 per month on average, while the nationwide average cost of memory care is $4,778 per month. It’s important to note that memory care rates in Mayo and the surrounding suburbs can vary widely based on factors such as location, the level of care needed, apartment size and the types of amenities offered at each community. Mayo and the surrounding area are home to numerous government agencies and non-profit organizations offering help for seniors searching for or currently residing in an assisted living community. These organizations can also provide assistance in a number of other eldercare services such as geriatric care management, elder law advice, estate planning, finding home care and health and wellness programs. To see a list of free memory care resources in Mayo, please visit our Assisted Living in Florida page. 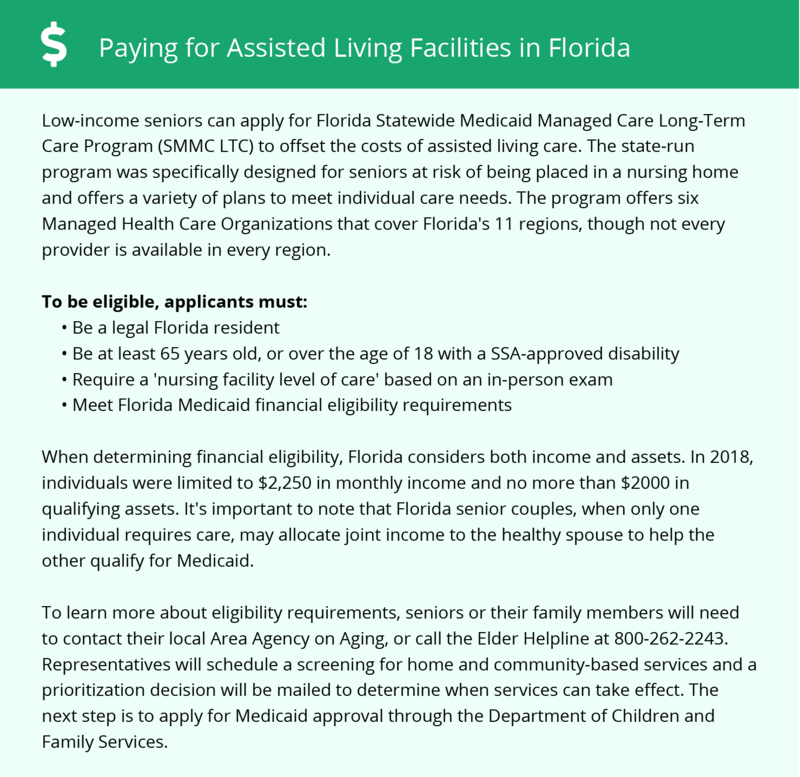 Mayo-area assisted living communities must adhere to the comprehensive set of state laws and regulations that all assisted living communities in Florida are required to follow. Visit our Memory Care in Florida page for more information about these laws.